Dental implants have quickly become the most preferred option to replace a missing tooth, which is why more than 3 million implants have already been placed. With dental implants offering a lifelong solution to treat tooth loss, the number of dental implants placed each year grows by 500,000. Unlike other dental prosthetics, dental implants offer far more benefits for your oral health and quality of life. 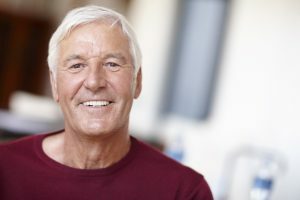 As a dentist for dental implants in Burlington, Complete Dental Care will help you regain a complete, confident smile with the most preferred form of tooth replacement. Dental implants are different than other common forms of tooth replacement because it involves a surgical procedure. To receive dental implants, the treatment process is performed in multiple phases. The first phase of treatment involves surgically inserting a biocompatible, titanium post into the jawbone to replace the tooth root. Over the course of the next couple of months, your jawbone will fuse to the implant post. After your jawbone has healed, a second surgery is performed to attach an abutment to the post. The abutment allows the gum tissue to heal correctly and is needed to hold the prosthetic crown in place. A couple of weeks after the abutment is placed, the custom-made dental crown is attached to complete the replacement. Dental implants offer exceptional benefits when compared to other replacement options. In addition to a lifelong solution, dental implants offer over a 95 percent success rate. In addition, implants are the only form of tooth replacement that most closely mimics the appearance and function of natural teeth. Best of all, dental implants stop and even reverse bone deterioration due to tooth loss. When a tooth is lost, it is no longer stimulated. As a result, the remaining natural teeth lose their support. Over time, the teeth will begin to shift and eventually fall out. The loss of bone will also cause facial structures to change. However, with dental implants, the bone is stimulated to encourage bone growth. As a result, the remaining natural teeth will have the support they need to stay in place and your facial structures remain protected. Just about everyone can benefit from dental implants if they have missing teeth, healthy gums, and adequate bone density. However, there are certain medications, health conditions and lifestyle habits that may prevent you from receiving implants. With infection the biggest threat to implant failure, you must not have any risk factors that may cause infection or reduce the body’s ability to heal. If you are ready to benefit from the best advancements in tooth replacement with dental implants, it is time to see if you are a candidate. We offer the consultations and treatment plans needed to replace missing teeth for a complete, confident smile. Complete Dental Care will help restore your smile with dental implants. Contact our office today to schedule a consultation.